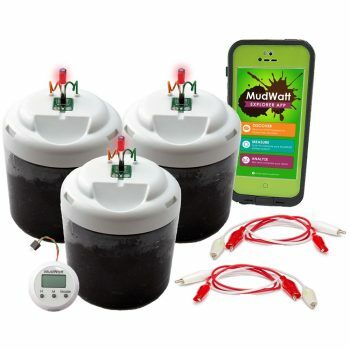 MudWatt Classic Kit, Just Add Water: Educational Innovations, Inc.
Our MudWatt products are fun and educational science kits that use the natural micro-organisms found in soil to generate electricity. Microbiology, chemistry, and electrical engineering all in one versatile STEM-based kit! Although we cannot see them with the naked eye, micro-organisms are all around us. One particular species of microbes possesses the unique ability to release electrons outside their bodies as part of their natural respiration. Each of our MudWatt kits utilizes this remarkable ability by providing mud-based microbes with two conductive graphite discs - the anode and cathode. The anode is placed within the mud where the electrogenic microbes can grow, and the cathode is placed on top, exposing it to oxygen in the air. All MudWatt kits come with everything you need, except soil. So dig in and get revved up! You'll know your bacteria is generating power when you see the LED light blinking. Free lessons and interactive MudWatt Explorer app available online. 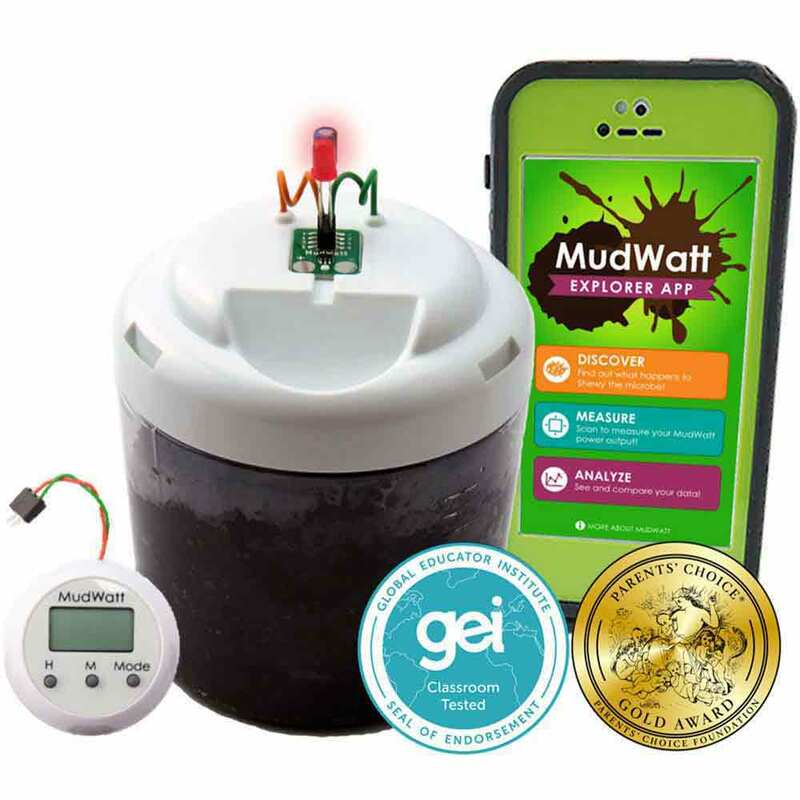 The MudWatt Classic Kit includes 1 MudWatt Anode, 1 MudWatt Cathode, 1 MudWatt Vessel, 1 MudWatt Hacker Pack (Blinker + Clock Circuits + Buzzer), 1 Educational/Instruction Booklet, 1 Pair of Black Nitrile Gloves, and the MudWatt Explorer App (available on iTunes and Google Play). You provide soil. Common to all MudWatt Kits: The MudWatt is a fun and educational science kit that uses the natural micro-organisms found within dirt to generate electricity! 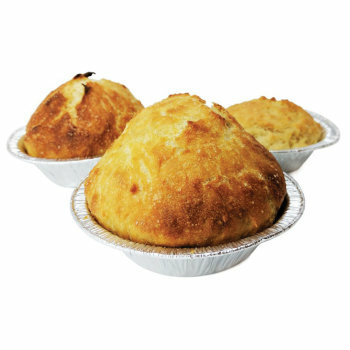 MudWatts are reusable and can last for years! Read more on our Blog - Electricity from Mud?! MudWatt NGSS Sub-Module 1: Meet the Microbes! Experiment: What Soil is Best? 'Shewy, the Electric Microbe' Comic Book! Students can use the MudWatt Kit to make observations of animals to compare the diversity of life in different habitats. Students can use the MudWatt Kit to analyze data from tests of two objects designed to solve the same problem to compare the strengths and weaknesses of how each performs. Students can use the MudWatt Kit in an investigation to construct an argument that some animals form groups that help members survive. Students can use the MudWatt Kit to make observations to provide evidence that energy can be transferred from place to place by electric current. Students can use the MudWatt Kit in an investigation to construct an argument that plants and animals have internal and external structures that function to support survival, growth, behavior, and reproduction. Students can use the MudWatt Kit to develop a model to demonstrate and describe the cycling of matter and flow of energy among living and nonliving parts of an ecosystem. Students can use the MudWatt Kit to develop a model to generate data for interactive testing and modification of a proposed object, tool, or process such that an optimal design can be achieved. Students can use the MudWatt Kit to develop a model to demonstrate and illustrate that the release or absorption of energy from a chemical reaction system depends upon the changes in total bond energy. Students can use the MudWatt Kit to develop and use models to illustrate that energy at the macroscopic scale can be accounted for as either motions of particles or energy stored in fields. Students can use the MudWatt Kit to design, build, and refine a device that works within given constraints to convert one form of energy into another form of energy. Students can use the MudWatt Kit in an investigation to analyze a major global challenge to specify qualitative and quantitative criteria and constraints for solutions that account for societal needs and wants. Microorganisms are all around. One particular species of microbes possesses the unique ability to release electrons outside their bodies as part of their natural respiration. 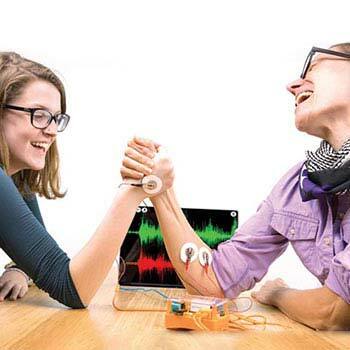 Students will know the bacteria are generating power when the LED light is blinking. An interactive MudWatt Explorer app gives students of all levels data and information regarding energy in the microbial fuel cell. 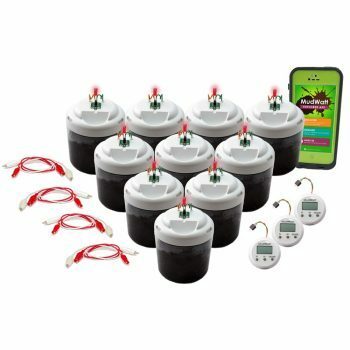 Use the MudWatt Kit to give young students concrete evidence that the microscopic animals in the mud produce energy that can be measured and used to light an LED. Students can use the MudWatt Kit in a variety of investigations to explore the cellular functions of organisms within ecosystems. The MudWatt Teacher's Guide has a wide range of lessons that include objectives, detailed instructions, inquiry practices, vocabulary enrichment, and student handouts. The MudWatt kits utilize the remarkable ability by providing mud-based microbes with two conductive graphite discs—the anode and cathode. Allow students to experiment to discover the optimal location for energy production. Lessons include rubrics for student self-monitoring and group work assessment. Students can use the MudWatt Kit for investigations that analyze a major global challenge such as clean renewable energy sources. Utilize the microbial fuel cell to gather data, guide analysis, and apply critical thinking skills to an engineering problem.